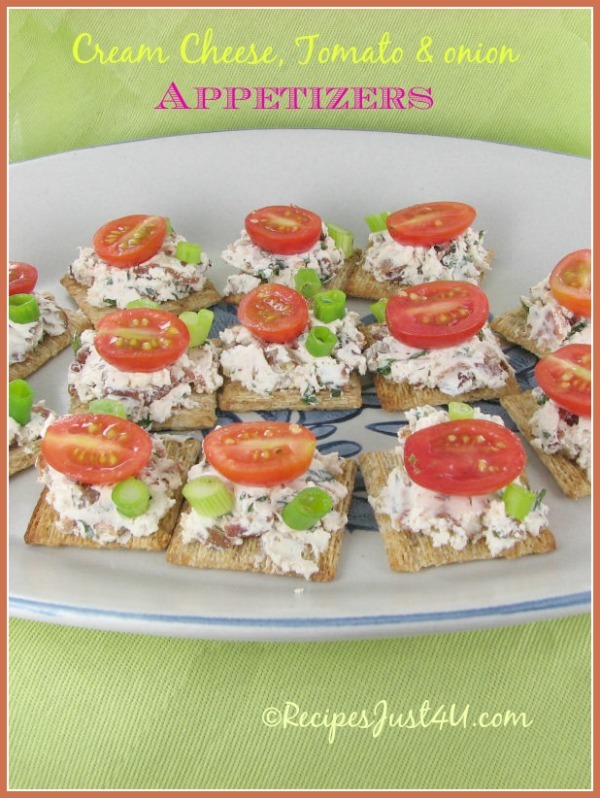 These cream cheese appetizers with Tomato and spring onion were another big hit at my Christmas party this year. What I liked best easy appetizers like these, is that the mixture kept its consistency well and did not make the crackers soggy, so they could be made a little ahead of time. The taste is delicious. If you are looking for 30 minute meals or appetizers, this one is always a hit at my parties. 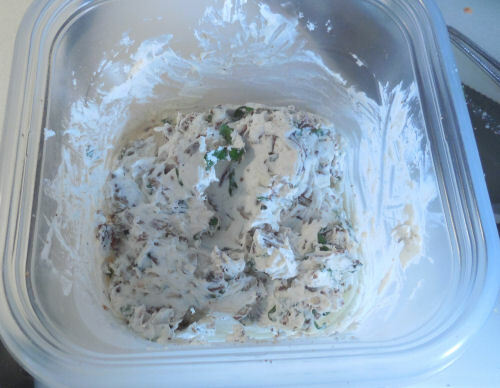 Combine the cream cheese with the basil, cilantro, chopped pecans and crumbled bacon. 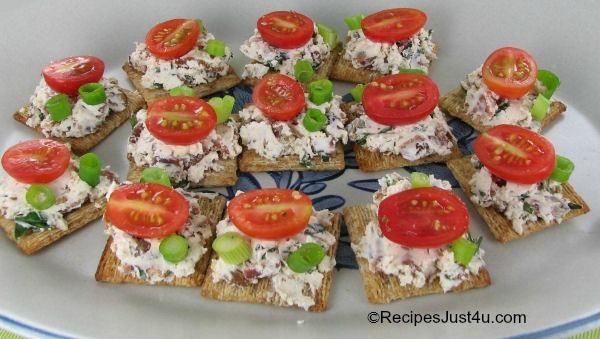 Spread about a tablespoon of the cream cheese mix on each Trisket cracker. Top with one half grape tomato and sprinkle with spring onions and serve. They are delicious, easy to make and very popular. For another great party appetizer, check out these pretzel crusted chicken tenders. 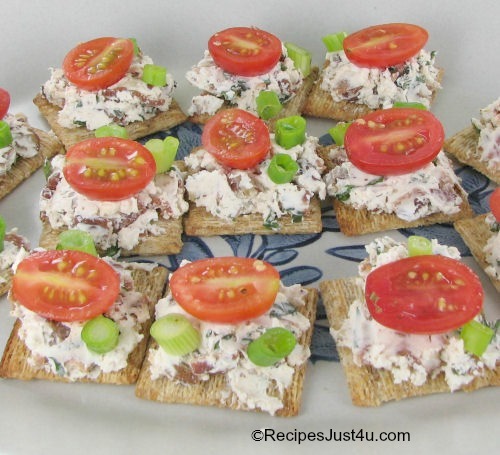 These cream cheese and tomato appetizers are simple to make and your party guests will love them. 1/4 cup of chopped pecans. 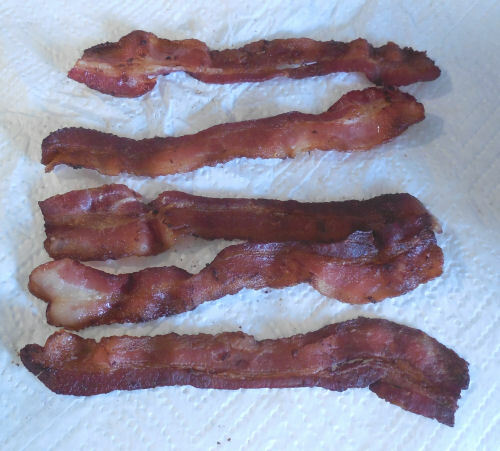 Cook the bacon in a 350 º preheated oven for about 15 minutes. Remove and crumble. Combine the cream cheese, chopped pecans, crumbled bacon and fresh herbs in a small bowl. Spread each water cracker with a layer of the cream cheese mixture. Add a cherry tomato half, sprinkle with diced spring onions and add a very light drizzle of olive oil, if desired.